I had multiple authors stick Post-It notes on their books asking me not to publicly post a bad review if I disliked their work, which would be understandable if not for the fact that I make sure to warn them that sending me a copy means they could receive a bad review. I let it slide this year to a large degree, but will not be so kind in the future. I received packages from every US time zone but the Alaskan. New York state was the runaway self-publishing submission spot in 2013. It was interesting to see the varying levels of investment authors put behind their work. Some were quite Internet savvy, some included promotional merchandise with their work, some hired agents to send me seriously legitimate press kits, and some just sent the book in a plain yellow envelope. None of these methods provided undue influence in the review, but it is still noteworthy. Okay, without further adieu, let me tell you which of the three Buys in this category was the best. I hate to sound like a judge on a reality talent show, but deciding on a winner was, like, really hard you guys:) None of the three nominees fell into my "Best of the Best" books stratum. Plus, they each had a con that was rather significant (illustration, extreme premise, repeated phrase). 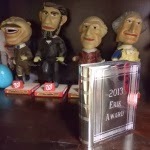 In the end, I had to remind myself that the ERIK Award is a prize centered on elevation over elimination. In other words, I didn't need to compare the titles against each other. I just had to pick the one my son and I liked reading the most. So, let me congratulate Carole P. Roman and her book Captain No Beard for being the first entrant in the ERIK Award Hall of Fame! Congrats Carole & Captain No Beard! And a good choice! The Captain No Beard books are super! Excellent choice and congratulations to Carole P. Roman.